Blinking reveals the impact of individual defects on the luminescence yield in perovskite semiconductors. Exploring this phenomenon in temperature dependent experiments allows us to gain fundamental insights into non-radiative recombination processes at the microscopic level. Even though metal halide perovskites have been investigated already in the 1970s and 1980s, it took until the recent decade before their outstanding performance as solar cell and light emitting materials was recognized, leading to a veritable boom in the field. However, our understanding of the underlying photophysics is still lacking behind. In particular, it is important to understand and suppress non-radiative recombination losses of charge carriers. As in many semiconductors, a strong indicator of non-radiative decay is the luminescence quantum yield, which rises upon cooling of the material due to passivation of defects. Additionally, metal halide perovskites show luminescence blinking, which points towards the presence of very efficient non-radiative centers that are able to switch between active and passive states on time scales including milliseconds and several tens of seconds. Doubtlessly, the material quality would benefit from permanent passivation of these metastable recombination centers. However, at the same time we realized that the presence of blinking in metal halide perovskites gives us the unique opportunity to study non-radiative decay at the level of single defects. To find out more about their contribution to the overall luminescence yield, we used luminescence microscopy to explore how the blinking in nanocrystals of prototypical methylammonium lead iodide changed as function of temperature. Surprisingly, the crystals revealed very individual blinking characteristics, leading to a high variety of slopes in their temperature dependent luminescence yield (see plots and movies below). Only averaging over a large number of crystals resulted in a trend of the luminescence yield similar to that observed in spatially integrated experiments. We attribute this diverse behavior in different crystals to the strong influence of individual defects, which, however, became less pronounced upon cooling, because their quenching efficiency reduced, as we observed directly in a reduction of the relative blinking amplitudes. 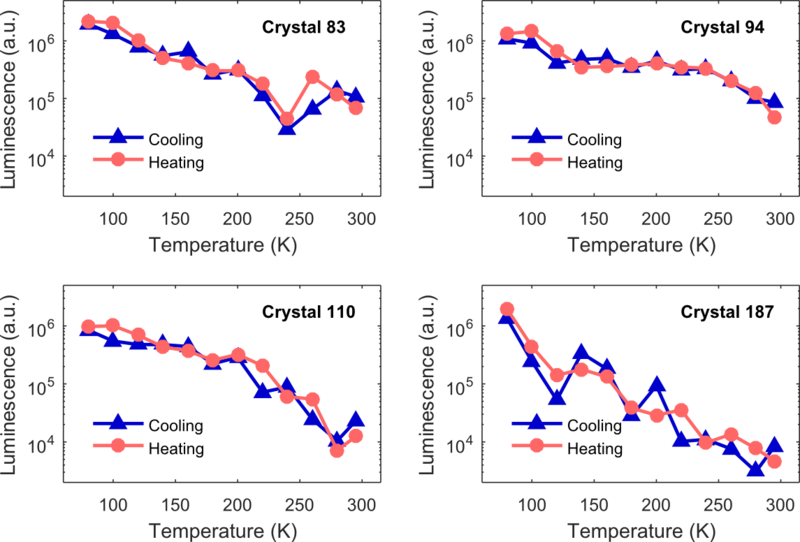 Temperature dependent time-integrated luminescence intensity recorded for different crystals for a cooling and subsequent heating cycle. Highly individual slopes become apparent. At the beginning of our experimental work we were facing a difficult time, because the various temperature dependencies made the same illuminated group of crystals look drastically different at different temperatures. As a consequence, after varying the sample temperature the experimentalist was in danger of losing orientation on the sample and with this the progress of a day’s work. However, after realizing that the reason for this problem was actually an interesting physical phenomenon, we took appropriate precautions and our experiment became easier to handle, allowing us focus on the science behind. By invoking a simple activation model, we estimated energetic barriers for thermal activation of the switching on the order of several 100 meV. The blinking mechanism could thus be related to ionic transport, for which similar numbers have been reported. However, since most of the abundant ionic defects in metal halide perovskites do not act as severe luminescence quenchers, we suggest that a migrating defect needs something extra to open the efficient non-radiative channel . This additional component could be a structural defect or another point defect. We propose that further consideration of such multi component ‘quenching complexes’ and their metastability could be an important step towards unravelling the nature the underlying defect species.